Hello! I am Sarah Wilkinson, Producer of Spotlight Productions and I would like to welcome you to our new website, which has been lovingly created by Mark Heath. The new website is designed to be viewed on all types of devices, including mobile phones, and is ‘retina enabled’ so that you can view images from our shows in the best image quality possible. In this news section, you will find updates on our current production, Sister Act the Musical, as well as news on what is going on in the group and features on past and present members. Over the past few weeks, the Spotlight team has been moving our 25,000+ costumes, props and scenery to our new storage unit on Alconbury Weald, Huntingdon. As shown in the photos below, our sponsors have once again done us proud by providing us with an aircraft hangar! It now looks amazing and I can’t wait for all the cast and crew to see it when we get to costuming our current show. This Saturday (2nd September 2017) will be an exciting day as we audition for the Principal roles for our current show – Sister Act the Musical. I am sure those auditioning are busy learning their songs and lines and even getting a little nervous! We are really looking forward to having our final cast named and starting rehearsals on Tuesday. Over the next few months, I will be contacting some past members of our cast, to find out what they are up to now, so watch out for my Facebook message. In addition, I will be asking our current cast and crew to give their own personal updates on how this year’s show is progressing, with some ‘sneaky peak’ showreels of the cast in rehearsal. 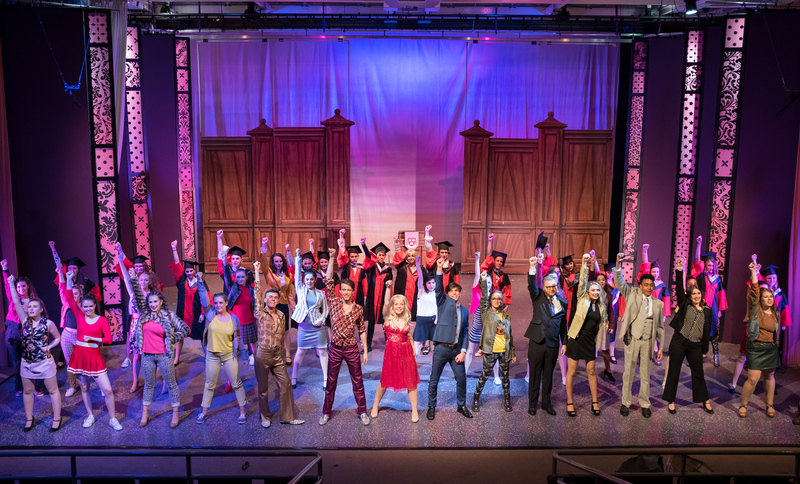 Last year’s production of Legally Blonde the Musical (shown above) sold out three weeks prior to the show, so please remember that priority tickets to cast members will go on sale at the beginning of December and will then be available to the public on the 2nd January 2018. If you would like more information about Spotlight Productions, please contact us.